HÀ NỘI – Prime Minister Nguyễn Xuân Phúc expressed his delight at the growing co-operation between Việt Nam and the WEF during a meeting on Wednesday with the founder and executive chairman of the World Economic Forum (WEF), Klaus Schwab, who is in Hà Nội to co-chair the WEF on ASEAN 2018. He appreciated the WEF’s close co-ordination in working with Việt Nam to build the theme, content, and agenda of the WEF ASEAN, stressing that this forum’s theme – “ASEAN 4.0: Entrepreneurship and the Fourth Industrial Revolution” – matched global trends, suited ASEAN countries’ interests, and was associated with the “Resilience and Innovation” ASEAN focus for 2018. The Government leader asked the WEF to support Việt Nam’s ideas and initiatives in terms of promoting ASEAN-WEF co-operation. He also thanked Schwab for supporting the implementation of the WEF’s co-operation agreement with Việt Nam, noting that the country had many advantages and is making efforts to grasp opportunities arising from Industry 4.0. PM Phúc called on the WEF to actively assist and advise Việt Nam on how to improve its readiness to effectively participate in Industry 4.0. 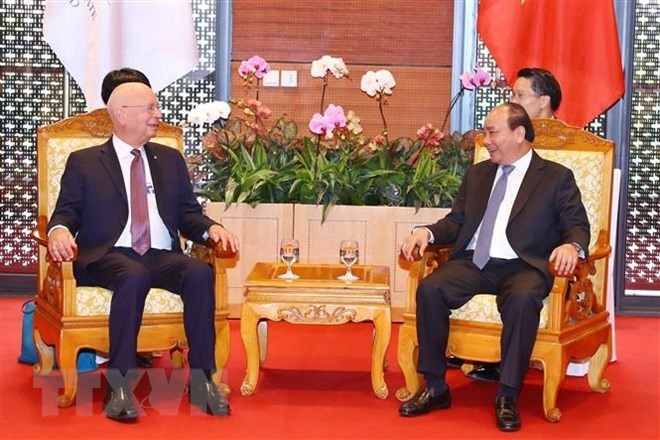 At the meeting, Schwab said he was happy to return to Việt Nam and was impressed with the fast development and spectacular changes that had taken place. He thanked the Vietnamese Government for supporting and working closely with the WEF to prepare for the upcoming forum, expressing his belief that the event would be successful. The chairman spoke highly of the co-operation agreement signed with Việt Nam at the WEF in Davos in 2017 and noted that Việt Nam was the first country in the region that the WEF had signed a co-operation deal with. The WEF would continue working with Việt Nam to realise this agreement to ready the country and increase its participation in the Fourth Industrial Revolution, he said.